I didn’t get many projects completed in June. Just two. But hey, they involved making toiles and more complicated, time-consuming sewing than a simple t-shirt. One was a summer blouse, Butterick B6217, and my very first make for the Minerva Crafts Blog. The other is a pair of purple Flared Shorts from Gertie Sews Vintage Casual. I know I said I was making the Cigarette Pants, but the toile revealed some fitting issues, so I wanted to check out my changes at the hip area before cutting into my trouser fabric. Luckily I had just enough stretch fabric left in my stash to make these, and I needed shorts too! You’ll see these on the blog later this week. I suppose you could count Gabriel’s hat as being technically completed in June, but it was almost finished by the end of May anyway. Two more projects (the Hacci Kimono and the Striped Pencil Skirt) were cut and ready to sew by the end of June. Admittedly they haven’t progressed much since then, but I’m getting around to them. Honest. I think I’m being crazily overambitious again, but these are all relatively simple patterns so who knows, I might manage it all in the next twenty days, especially as I’ve already done some pattern tracing and toiled the Crepe bodice. Oh wait, I’ve got that pencil skirt and kimono to finish still. Hmm… I reckon the pedal pushers might not make the cut for July, but I want the rest of these summer garments for my holiday–we’re going to the Cote d’Azur for the first week in August and it’s going to be HOT!! !–so will do my best to sew ALL THE THINGS!!! 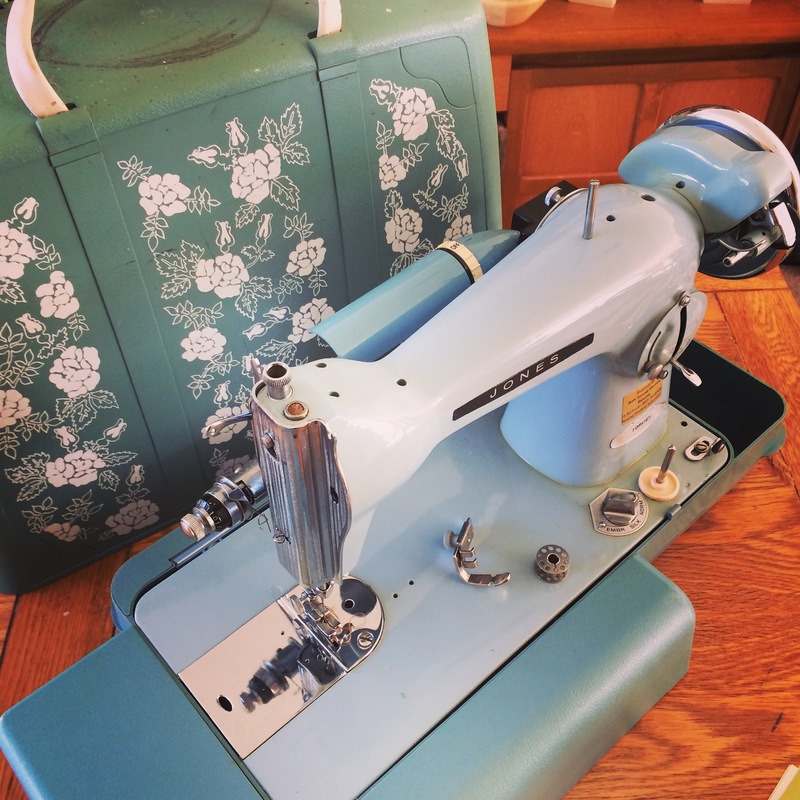 She’s a motorised straight stitch machine–all metal–from Jones. I’d never heard of Jones before, but it turns out they were a quality English sewing machine manufacturer, who were taken over by Brother in the late sixties. This must have been one of their last models. She’s still in full working order, but the belt needs replacing to be able to sew with the motor. I’m really looking forward to getting her to work as a second machine for topstitching would be marvellous! That might not be her only job either, as you can still buy the presser feet to fit her, and they’re much cheaper than Bernina presser feet (my other machine is a Bernina–lovely, except for when it comes to paying for accessories). I might treat myself to a Jones invisible zip foot so I can finally put the damn things in properly! What are you planning to make this month? Anyone else busy sewing for upcoming holidays? I’m also planning on making the cigarette pants. Also have shorts to make to test the fit befor cutting into my stretch denim. I used to have a Jones machine. It wa a mechanical zig zag. I was given it in 1992 and it was old then. Finally gave up about 6 years ago. Now have a vintage Bernina. Oh wow, it sounds like we’re in some weird kind of synchronicity! My Bernina is a vintage–1980s I think (how sad that now counts as vintage–makes me feel old!). They are the best machines. I don’t know how people ever keep sewing on some of those cheap plastic machines. Just not pleasurable at all! You were certainly busy! Cute sewing machine too! I love the metal ones. They have such a special sound! Thanks! Metal sewing machines are the best. Just not much fun to carry places! I spent the last couple of mornings moving a load of topsoil, so I think I’ve had enough of an upper body workout for one week already. The sewing machines stay put!